Man-made waterfall According to the China Modernization Report 2007---put out by academics at some of China’s top universities--- China ranked 100th out of 117 countries in environmental protection, This was the same ranking it had three years earlier, leading one to conclude that not only is China’s ranking poor but is not improving or making progress. A report by the OECD suggested 51 initiatives that China could make to improve its “deteriorating environmental conditions.” Among them is making local leaders more accountable for environmental damage and introducing market mechanism such as pollution charges to meet environmental targets. In China, some have called for the death penalty for the worst environmental crimes. A new generation of animal and nature lovers is emerging in China but the rate of their emergence and the fact that are relatively powerless has limited the impact they have had. Meanwhile the environments continues to be squeezed and disrupted. Already China’s parks are overwhelmed by tourists and encroachment from factories, farmers and fishermen. Book: The River Runs Black by Elizabeth C. Economy (Cornell, 2004) is one of the best recently-written books on China’s environmental problems. In his book China on the Edge: the Crisis of Ecology and Development in China, the Chinese intellectual He Bochun argues that in many ways China's environmental problems have already reached catastrophic levels. A lot of effort and energy is going into improving the environment in China. Engineers are developing new technologies to fight pollution (see cement plants under Air Pollution). Concerned citizens and grassroots groups are filing lawsuits, organizing protests, exposing polluters on the Internet and lobbying officials to do something about pollution. Increasingly existing and future bureaucrats are being required to take courses on environmental issues. According to insiders a lot of time is devoted to environmental issues within the upper echelons of the Chinese government. Many Chinese are offended by the grim, hopeless tone in which articles on Chinese pollution are written in the West, and insist the Chinese are doing their best and they are doing a lot to improve the situation. Around Beijing, the government has 1) built to 1,000-foot-high towers to measure pollutants and wind speed at different altitudes, 2) shot lasers at reflectors on distant buildings to determine what was in the air, and 3) gotten data from U.S. satellites to see how ground-based observations match up with what is seen from space. “There weren’t any warnings posted in factories, and I never saw a Lishui newspaper article about pleather; assembly line workers rarely read the newspaper anyway. They didn’t know anyone who became ill, and they couldn’t tell me whether there had been any scientific studies of the risks...Nevertheless their beliefs ran so deep that they shaped this particular industry. Virtually no young women worked on the assembly lines, and companies had to offer relatively high wages to attract anybody. At this plant you saw many older men---the kind of people who can’t get jobs at most Chinese factories.” When compared with the available data on plastic leather manufacturing many of suspicions raised in the rumors were backed by the data. The State Environmental. Protection Administration (SEPA) is the government body that deals with environmental issues. It is small and has limited authority, with 200 employees compared to 18,000 at the EPA in the United States. It is very weak and powerless in going after polluters protected by local governments. In March 2008, the environmental government agency was given ministry status and power to punish polluters. The government mainly tackles environmental problems by issuing command quotas and launching tree planting campaigns. It still lacks an effective system of incentives to persuade polluters to install emissions-control equipment and it fails to impose serious fines on violators. Even factories that have pollution-reducing technology often don’t use it in order to cut costs or they don’t use it correctly, limiting its life span of the equipment and sometimes risking accidents. Some argue that China can tackle its environmental problem unless these is some kind of political change. Mao Zedong believed that “man must conquer nature” rather than live in harmony with it. After the Communists came to power in 1949, large dams and irrigation projects were undertaken, lakes were drained, hillsides were converted into fields all with little concern for the environment. Protecting the environment was not a high priority. Increasing the output of heavy industry and building massive irrigation projects were regarded as more important than clean air and water. Most waste-water treatment plants worked poorly; outdated metal-working factories emitted thick toxic air pollution; and the old Soviet-made nuclear power plants were unsafe. Since the Deng reforms in the late 1970s, Chinese have been oriented towards development and making money. Although environmental concerns are given a higher priority than they were they are still secondary to economic growth. Environmental laws were established in 1979 and have been largely ignored. Jiang Zemin, Chinese president in the late 1990s and early 2000s, put his support behind certain environmental causes but put more emphasiz on industrialization and economic growth. In March 2008, the Chinese government created a special ministry, the new Environmental Protection Agency, to tackle China’s environmental problems. Environmental groups welcomes the move but said for the ministry to really make a difference it needed tougher powers to enforce its mandate. Many efforts to clean up China are hindered by local officials who worry about job losses of closed factories or are concerned about losing kickback and money they have invested in polluting factories. These officials fail to enforce environmental standards out of fear of adversely affecting business and, in some cases, own or partly own the most polluting factories. In any case the owners of polluting factories often have close ties with local government officials and form strong self -interest groups. In recent years banks have been given the right to deny loans to polluters; officials can make violators issue humiliating public apologies on television; and utility companies can raise rates for factories caught wasting resources. In 2006, the central government environmental protection agency began investigating local officials suspected of submitting fake data on emissions of carbon dioxide and sulfur dioxide because if they didn’t sunmit such date they would have failed to meet clean air targets. A local government effort to beautify Laoshou Mountain in Yunnan Province, which had be used for quarrying stone, was to spend $56,000 to spray green paint over several acres of rock. The government spent $10 billion a year on environmental protection in the early 2000s or about 1.3 percent of GDP. The new five year plan issued in 2006 calls for a reduction of industrial pollution by one tenth and spending on environmental protection to increase to $35 billion from 2006 to 2010. Beijing is increasingly accepting the fact that China has some serious environmental problems and something has to be done before it is too late. Leaders frequently make public statements about China’s environmental problems; and more laws and policy changes are being pushed forward that address these problems. To tackle pollution China has reduced subsides on fuel and gotten rid of tax breaks for heavy industry. In the late 1990s and early 2000s, Beijing introduced new environmental legislation that among other things required developers to complete environmental impact studies. The efforts to address China’s environmental problems really began in earnest in 2004 when a top environmental official said, “If we continue on this path of traditional industrial civilization, there is no chance that we will have sustainable development.” Among other thing he encouraged more recycling, using more renewable energy sources and devoting more government funds to fighting pollution. In January 2005, the Chinese government ordered a halt of construction on 30 power plants over environmental concerns, most for failing to complete environmental impact studies. In December 2005, Beijing announced “green” incentives and loans for industries, including mining, foreign and oil and gas exploration, that focused on environmentally-friendly projects. China introduced a range of consumption taxes in 2006 such as levies on gas-guzzling cars and disposable chopsticks that are aimed at improving the environment. In April 2006, SEPA ordered the clean up of 30 chemical and petroleum sites, some them owned by China’s largest companies, and stopped or postpone work on 44 projects, worth $18.7 billion, because they were deemed unsafe. In July 2010, the central government ordered cities to close inefficient factories by the following September. Even before that, in the previous three years, China had shut down more than a thousand older coal-fired power plants. During the economic crisis in 2008 and 2009 heavy-polluting factories in dire straits financially were less likely to be given loans to stay afloat that factories that didn’t pollute so much. A good chunk of the $584 billion stimulus package launched to help the economy in global economic crisis in 2008 and 2009 went to improve polluting and energy-intensive industries but an even larger chunk went to infrastructure and building projects that need lots of cement and metals that require lots of energy to produce. Some environmental lawyers estimate that only 10 percent of environmental laws are enforced in China. In addition, clean up efforts are undermined by cheap capital and bureaucratic enthusiasm for wasteful development and industrial schemes. Unable to count on its bureaucracy, Beijing has tacitly but warily endorsed pressure put on polluters by the media and grassroots activists. One of the biggest changes in China’s environmental policy is the introduction of performance rating systems for officials that evaluate their performance on environmental protection as well as economic growth. in Guangdong Province factory owners have asked for a rollback on some environmental regulations that they complains makes them unable to compete with factories in Southeast Asia. Nationwide mangers under pressure to cut costs turn off scrubbers and dump waste rather than treat it to save money. “To deal with this, environmentalists say even the most progressive top-down policies need to be balanced with greater awareness at the grassroots otherwise China will follow the west in looking clean but consuming dirty. "I'm hopeful about the next five-year plan," said Li Bo of Friends of Nature. "The government is prepared to go further than before. But we should do more. Until now, low carbon concepts have been introduced only for industry. In the future, I hope those ideas can be adopted in the community so we see a change in lifestyles." "We are expecting to see a truly green five-year plan, which for the first time will contain really detailed measures and teeth in it," said Yang Ailun of Greenpeace. "The next five years will be the defining moment for China's environmental movement. There will be more disasters and more of a struggle to impose tougher regulations. Local interests groups have grown quite strong. They won't accept change quietly." Ma Jun, of the Institute for Public and Environmental Affairs, said the government would take a big step forward if it set absolute limits on pollutants and resource consumption, rather than the incremental, economy-linked targets seen until now. "I don't consider this a turning point," said Ma. "We haven't seen air and water really get clean yet. The measures under discussion are not sufficient at all. " What we weren’t told; 1) While the report included some information on air quality, it didn’t include the all-important measurements of small particulate matter—known as PM 2.5 and PM 10 for each particle’s width in microns. These minuscule particles can be inhaled, causing infections and sometimes cancer, and have been blamed for 1.2 million premature deaths in China in 2010 alone. Beijing was hit by a particularly intense cloud of pollution in January, when the US embassy recorded PM 2.5 measurements at 291. Levels above 25 are considered unsafe. 2) The government continues to keep the results of a five-year soil pollution study that cost 1 billion yuan ($163 million) under wraps (the results were classified as a state secret earlier this year). In April, a senior environmental official revealed that as much as 65 percent of fertilizer in China was used improperly. Some researchers say that up to 70 percent of Chinese soil is polluted. 3) No information was provided to explain how 44 percent of rice in the city of Guangzhou became polluted with dangerous levels of cadmium, an issue that has enraged people in China and sparked debate about the availability of information. “The word “growth” in Chinese simply means “to increase or become larger,” and is used in such phrases as “an increase in GDP.” Previously, the words “growth” and “development,” have been considered to be essentially the same idea in China, but people have come to recognize the difference. The new concept of “Scientific development” sees the importance of public welfare, which leads to people's happiness and well-being. It aims to enhance their quality of life by improving social security, housing, medical services, and pensions. GDP has been widely used as an criteria to measure economic development, but now various other criteria are being examined to measure overall human development. China's reform and opening up...specifically market reform, I regret to say that it has gone too far. In the process toward a market economy, the government gave up its role, thus causing various problems in the society. Such problems are often seen in medical services, housing, and education. In the educational field, for example, an increasing number of universities set up their own companies, and some professors appear to be more enthusiastic about making money than teaching students. On the face of it, this trend seems to revitalize universities, but it is questionable whether these universities can provide meaningful education. 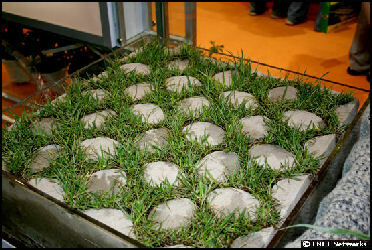 Grasscrete used at Beijing Olympics China desperately wants energy-saving and environmentally-friendly technologies from the developed world. Many see China’s environmental problems as business opportunities. Water and waste companies like the Paris-based Veolia Environment and Suez are attracting a large amount of investment and their share prices are rising as they position themselves for action in China. Together they have invested over $1.3 billion in urban water treatment and distribution systems. Guangdong Investment, which operates water supply businesses, and Suntech Power, the largest solar cell maker in China, are also drawing the attention of investors. Other companies hope to reap profits by helping to slow land erosion, reducing air pollution emissions, purify polluted water and providing renewable energy. Many feel the develop first and worry about pollution later strategy is doomed to fail. In many cases simply tacking on some technology is not enough. Often, it is better to scrap a plant or facility and build a new one from scratch. The Chinese government often seems reluctant to use market-based means to tackle pollution such as providing incentives to build pollution-fighting technology and adding surcharges for coal, energy and water that reflects their true costs. Japanese companies are introducing recycling methods and, water- and air-cleaning technologic to China. Fuji Xerox has built a $6 million factory that collects used copy machines, printers and ink cartridges and exacts 64 materials form them, including steel, aluminum and glass. Guangzhou Honda’s second factory in Guangdong Province is outfit with the latest zero emission technologies, which include a water treatment plant that treats all water so that it is clean before it is discharged. Matsushita uses similar technologies at a plant that makes cathode ray tubes. A report issued by Australia’s Climate Institute in October 2010 ranked China as a leader in the pursuit of clean energy. It ranked only second behind Britain in incentives offered to pollution created from electricity generation. Among the environmental technology that Japan plans to share with China are advanced nuclear reactors, clean steel mills and hybrid cars. Since the 1990s the Japanese have supplied China with facilities that capture the heat and pressurized gas byproducts of cement and steel manufacturing and garbage incineration plants that generate electricity. Nippon Steel has introduced a type of eco-friendly technology called dry coking. It produces coke, a form of coal necessary for making steel, by cooling it with nitrogen rather than water, which significantly reduces the amount of carbon dioxide released. 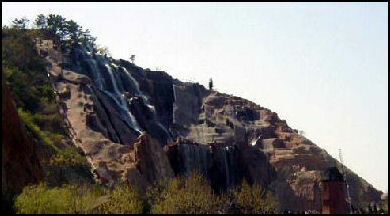 The resulting steam is used to produce electricity. An advanced sewage treatment system that utilizes ozone is being introduced by Mitsubishi to Beijing. In providing China with a cleaner environment Japan hopes to generate enough business to help boost its sluggish economy and troubled companies. Some obstacles remain, namely fears among Japanese companies that Chinese companies swill ignore intellectual property rights and steal their technology. We’re at a stage of unprecedented industrialization, but there have to be better ways to handle the problem, said Ma, whose organization. Sometimes it painful to look at the data. A particularly hot summer has added to Beijing high pollution levels.